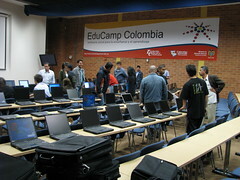 On November 20 we'll begin a new series of EduCamps in several cities in Colombia. That's more than enough reason to try and finish the report of what happened in last year's workshops , as a starting point for thinking about how to improve them this year. This is the second in a series of four posts on this subject. 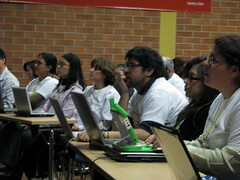 The workshop in Bogota was the first one we did. With logistical support from CINTEL (the most important telecommunication research center in our country), we found a space designed for mass gatherings (called Logyk, if I remember correctly), where we arranged things to carry out the experiment. After conducting several meetings with the entire CINTEL and MoE (Ministry of Education) teams, explaining in detail what we wanted to do, and showing how part of the challenge was to achieve a very open and informal (which, incidentally, was so uncommon as stimulating for all of us), we got to the day before the event (Tuesday, December 4 2007). While the staff members were putting on place tables, chairs and computers (all these hired by MoE with support from CINTEL), my previous work was to meet with Stephen and a group of students who would help us to coordinate the workshop the next day (all of them selected by CINTEL). These students were supposed to be "catalysts" for the activity of over-the-shoulder learning. In the first meetings, we wondered what would happen if among the participants, we could not find users of any of the proposed tools. This made us consider the importance of having some knowledgeable users to start the activity. And here began the surprises. My initial assumption was that these students would have knowledge of the tools selected (by completing a total of 10) because, after all, they are "digital natives". The fact was that most of these tools were unknown to them too, although they had much experience in handling some of them (the most "social" ones). The meeting was little more than a short description of what was supposed to happen the next day, in an atmosphere much more formal that I would have liked (a roundtable). I think this was caused, in part, by our own ignorance about what would happen. Meanwhile, staff were setting up the room where we would have the initial conference, placing tables and chairs in neat rows, in a traditional lecture format. Next morning, the registration started very early, and one of the big surprises for the participant were the white t-shirts we were giving them. Stephen and MoE staff (myself included) would have black t-shirts. The support students were dressed in red ones. The other participants would receive a white one. The t-shirt fulfilled two functions: first, to make easy for participants to tag themselves (in a previous meeting, someone suggested that people dressed with special clothing would be completely unwilling to stick adhesives to it); second, this simple garment helped to generate a sense of identity. After many greetings and reunions with old acquaintances, and a reasonably informal atmosphere, we started the workshop. * Upon arrival, be prepared to share with other participants. * When you leave, be prepared to share with the world. * We are all learners. * No one is a tourist. For me, the last one is perhaps the most important of all, and I think it speaks of something that also appeared in CCK08: It is not possible for one person to learn everything, or consume all the information produced by a large group of people . That is the world we live in. So we need to understand that we can only do what is within our reach, and that whatever that is, it is fine. Very philosophical. As usual, Stephen caught the attention of the audience (not just of those who understood English, but everyone, thanks to the excellent work of the interpreters who supported the event). An interesting aspect of each person having his own computer, was discovering how many of them sought ways to record their ideas on the conference,whether by taking notes online, or using text processors and then emailing the files the themselves. (Tip: It is important to identify ways in which all participants can benefit from these notes, which we did not this first time). After this talk, we started our work. The first thing we proposed to the participants was to draw their personal learning environment (PLE), and then start a process of peer learning (because everyone had a laptop), where everyone was expected to be both learner and teacher at the same time. The first part might not have had the impact we wanted, because I realized too late the need to expand a bit more what Stephen had mentioned on the PLE concept, and the only example I had at hand was a very raw diagram I made by hand before the workshop. (Tip: For this year, the ideas on PLE have matured a lot more. We have new elements to help participants make sense of their PLEs). Once they made explicit which tools they used in their PLE, they would have to write down each tool in an adhesive label (that is, a tag) and put it on their t-shirt. Those labels would represent those things they knew about, those things they could teach about. They were asked to identify the tools they would like to know more about (we gave them a "tool sheet" including descriptions and URL of several tools, in 13 categories), and their mission was to find someone tagged with the tool they wanted to learn about, and ask that person to teach them about it. With some initial diagrams, and the excuse of a coffee break in the middle of the morning, participants addressed the second part of the job, now with a much more informal atmosphere (tables and chairs were unorganized, and many people were on the space outside the auditorium, where more comfortable couches and sofas could be found). The only real requirement for this activity was a working Internet connection, for it was here where would be the greatest burden for the network. That was the only thing that was not supposed to fail. I think I heard the statement "If something can go wrong, it will" about 15 years ago, and since then (and with the multitude of paragraphs and corollaries added to it) I keep it in mind as a reminder of how those things we don't want to happen are the ones set to occur more frequently. In the case of the workshop, the only thing that shouldn't have failed, connectivity, failed. The wireless routers that were in place could not endure the burden of all users and collapsed one after another, leaving only a very small group of people online. The flaw was visible only when usage of the access points became intense (because initially, because we were in lecture mode, there were not many people using the network services). This left us in a situation quite difficult during the rest of the morning. The only solution to the problem was getting new routers, which only would come around noon. Something that comes back to my mind, is that this incident created some tension between the organizers (including myself), because even though the response I received was "the network is not down" (which was absolutely correct from a technical point of view), the experience for everyone else was of a lousy network connection (which was unfair, given that we hired 20Mb for the day). So, it was noon, and we went to lunch. Just before we left, the connectivity problem was solved, which led us to alter the schedule we had planned. Despite of everything that happened, the balance was positive at noon. Participants were very engaged and just the messy environment was for many of them a remarkable thing. But we were faced with a real problem: very few people had the opportunity to experience throughout the morning with the tools we had anticipated. There were a lot of conversations, but there wasn't that much exploration. That left us in a difficult situation for the first activity of the afternoon (which intended to collect ideas on possible ways to use the tools). For this reason, we decided to change our plan on the fly, and use the work tables in the afternoon as "demonstration stations", in which students were asked to talk about the functionality and ways to use some of the tools. This was a case in which the idea of "Whatever happens is the only thing that could have happened" became true, even for us as organizers. And we faced the need to relax and accept that we would not achieve what we had initially imagined, but something different. Not better or worse, just different. However, not everything was perfect. We never thought the students would have to be in charge of "demonstration stations", so some of them (without liability on their part) did not have an adequate mastery of the tool they had to face. This meant that, for example, those who showed Facebook were able to show the participants what could be done with the tool, whereas there were cases (like Twitter, for example) in which for obvious reasons this activity was not so helpful. However, the situation was a great lesson who would use two days later, in Medellin. While all this was happening, we were streaming (and recording) using Ustream. We had a video feed showed in one of the two plasma TVs we had in the room, while the other (which was outside the auditorium) was frankly underused. The change in the dynamics meant that the activity that was planned for the beginning of the afternoon disappeared completely from the schedule. And instead of delaying everything, we continued with the rest of the agenda as we planned initially. We prepared a large "board" with two half-hour slots and five tables for each slot, to complete a total of 10 possible discussions. We invite attendees to propose their topics of discussion and to sit down on the tables according to the number assigned to the discussion, and according to their own interests. The game rule here was: "If you are not learning or taking part in a discussion, please move to another one", to remind everyone that it was not required to stay in a place where they did not feel they should be. Discussions proceeded without any problem, and then came the moment for every discussion leader to share their conclusions with the whole group. Curiously, this activity started to become kind of boring, not only because of the time (it was already 5p.m. ), but because of the extent to which some participants took their points. Adding up the fact that we had 10 discussions, the discussion became longer than we would have liked it to be. With this activity, we ended the first workshop. Due to accumulated fatigue throughout the day, we did not held a long meeting after that, but hardly discussed the critical aspects to be taken into account in Medellin, which became important lessons. Perhaps the first one is the importance of connectivity, and the need of having a plan B to make activities possible. The flexibility in design and objectives is crucial. The building of enough confidence as to propose a change on the road is essential, and in fact constitutes a message about the use of technology: We need to change our actions depending on the context that we have around us. The people of CINTEL proposed to play a little more with the room layout in Medellin, because we would have some space constraints. 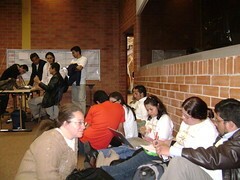 In Bogota, people left the auditorium after Stephen's conference (as there was a sort of lobby outside), which allowed us to reorganize tables and alter the space. We would not be able to do this in Medellín, so their proposal was to have a more informal atmosphere since the beginning. This messy space was, curiously, rather well received by many of the participants. We could not make assumptions about the ability of the support students in handling the tools. We would have to do something about this situation, before the second workshop. It was neccesary to limit the time for the final group discussion. Two days later, we would have our second "trail": Medellin. NOTE: Please let me know about mistakes and possible improvements in this writing. I tried to do a close translation of an Spanish post, so it may seem a little "funny" every now and then. Virtual Educa Brasil 2007: Presentando en Virtual Educa: Proyecto AVA-Uniandes.